Thanks for the photos. For ride signs, I prefer the colorful logos and only add the signs with restrictions to the index if a large logo sign doesn't exist. Another reason to do another TPR Scandi Tour, lol! What Tampere does, Helsinki cannot fail to copy, they might be saying... The Linnanmäki Amusement Park is the latest venue to introduce an Angry Birds attraction, hard on the heels of Särkanniemi in Tampere, although by all accounts it should have been the other way around. A correctly aimed shot towards a fortress on a giant slingshot using angry bird projectiles causes the pieces to tumble down in a domino fashion. But when the playground equipment manufacturer Lappset and the games developer Rovio donated an Angry Birds-themed playground to Save the Children Finland, and Helsinki’s Linnanmäki Amusement Park was chosen as the location of the attraction, the domino pieces seemed to be conspicuously absent. The donation was made already in December and Linnanmäki consequently voiced a request that the climbing attraction be set up in March, before the start of the summer season. But as it happens, not as much as a feather of the angry avians has thus far been seen in the amusement park. 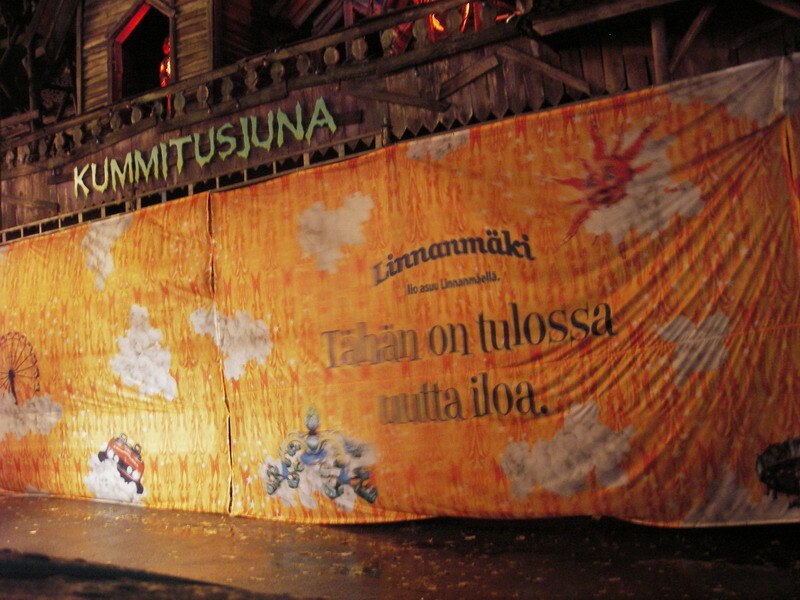 The attraction in question is not a massive themed area like that at the Tampere-based Särkänniemi Amusement Park. In Linnanmäki, the Angry Birds play area is merely directed towards little children and it will consist of at least a tower, a slide, and a slingshot. In Särkänniemi the Angry Birds Adventure Park, which was launched just before the May Day holiday, has brought a lot of action into the fun fair. “During the first couple of weeks the visitor figures were 40 to 50 per cent above average. As the reference period is fairly short, I am trying to be conservative with my estimate, but I am still excited beyond belief”, enthuses Särkänniemi managing director Miikka Seppälä. In the summer of 2011, the Särkänniemi Amusement Park was visited by half a million people. According to Seppälä, it is realistic to expect 100,000 more visitors this summer, now the birds are on hand. The legendary Ghost Train has been dismantled, only the roof of the building and the concrete foundings are left. Covering the building site are large sheets saying something similar to "Under funstruction". I've heard and witnessed that some/most of the animatronics inside had seen better days. Rumor also states that the old Ghost Train is just being replaced with a new one. Hopefully this 'facelift' will be a success like Blå Tåget at Gröna Lund, and not end up as a shooting ride. While I do like shooting dark rides, I'd just like to see a classic one at my home park. Oh yeah, and this week is the Carnival of Lights, meaning the park is open 17-22 every day until the season finale on Sunday. All the rides will have lights on (obviously) but there are also added lights and themed actors around the park. But what is by far the best thing is that they FINALLY have music playing in some of the rides, like the HUSS Booster and TopSpin! I hope it remains a traditional ghost train, also. I really enjoyed this one during TPR Scandi Tour. ^Agreed. That was a good one. Has tpr ever been to Linnanmäki? / Are they going to go? / Are there going to be videos? Last edited by jedimaster1227 on Fri Jul 05, 2013 11:49 am. Has there been any updates on the ghost train? Is it even open again yet? I can't say I remember it too well but I do remember the egg ride! I hope that is still there.